The Ultimate FREE Homeschool Planner: 30+ Amazing Printables! The Ultimate FREE Homeschool Planner: 30+ Printables! Calling all homeschooling moms and dads! 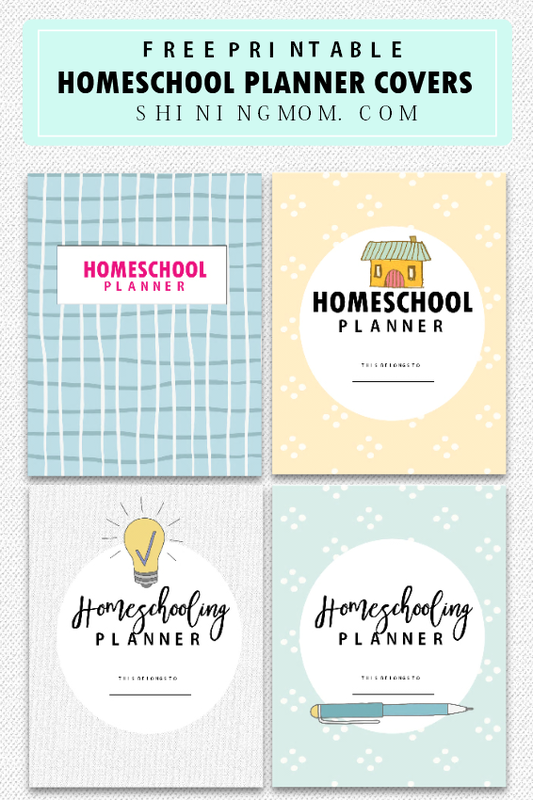 If you’re looking for a free homeschool planner, this post is for you! 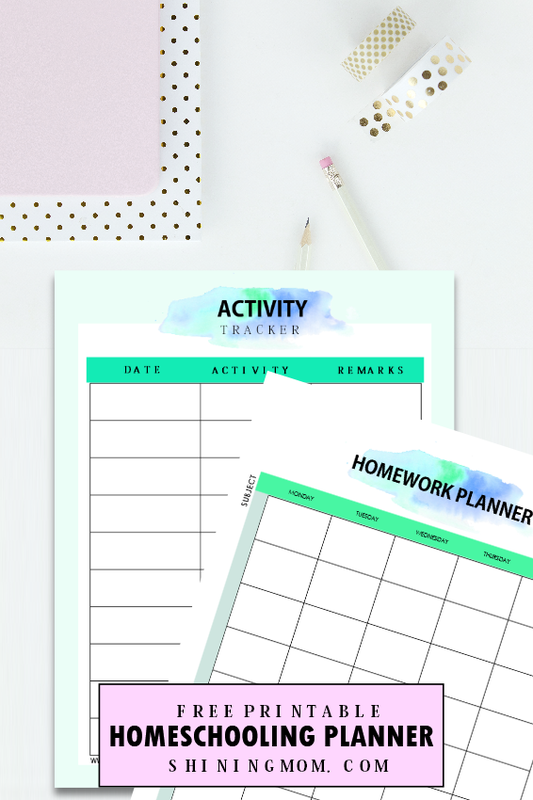 I am so excited because I am finally able to put together some homeschooling organizational printables that you can all enjoy. I understand how much chaos homeschooling can generate if you don’t have an organizing system, and probably, here’s all you need to get started! It’s no secret that I am a planner. I love to get things organized by listing down almost everything. From my weekly to-dos to daily tasks, to priorities; Name it, I probably have it listed. Planning has immensely changed my life. It has made me a more prepared, more confident and more productive person. And I share my love for planning on the blog. Regulars of Shining Mom know exactly that they can rely on the blog for their planner needs. From life planners to travel planners, I have the readers covered. I am happy that I have gained a substantial number of followers who have the same passion as mine. Together, using my basic planner layout, we love to plan without the overwhelm. I hope you, too, can join the Shining Mom crew by signing up for my newsletter which entitles you to receive all my planner updates! The Free Homeschool Planner: 30 Printable Pages! 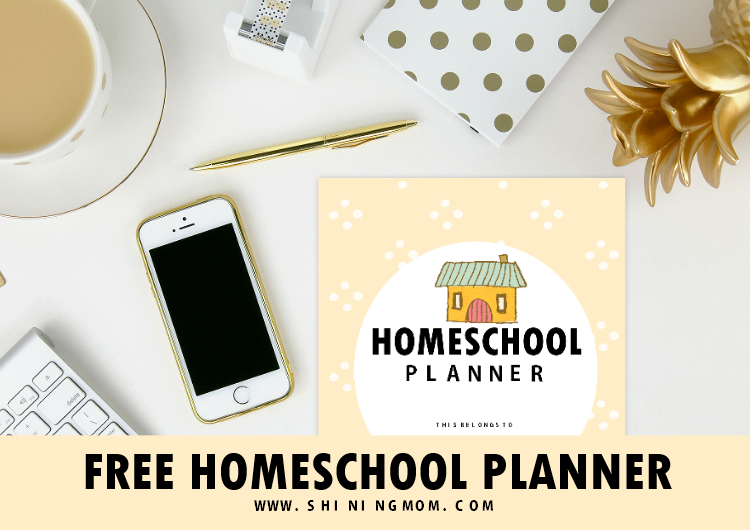 Speaking of planners, last week, it came to me that I also need to come up with a free homeschool planner. I realized how my two blog posts (student binder and teacher planner) are receiving massive views. A lot of people need organizers for school. “I should also create a planner to ease the homeschooling moms and dads out there”, I so thought. So this week, I tried my hands again in creating a planner, and this time it’s a pretty homeschool curriculum planner that I came up with. Since I was a teacher for eight years before deciding to blog full-time, the layout of the pages is based on what I needed in managing my class. 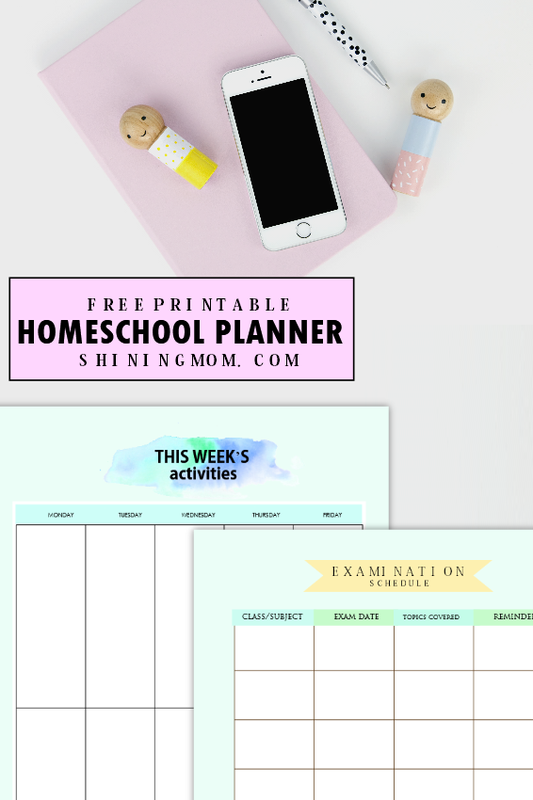 My experience in the classroom setting helped me create these homeschool organizational printables! I’ve also added unique pages that I believe to be especially es useful for homeschoolers. As Alton Brown famously said, “organization will set you free” and that is the case when it comes to homeschooling. You need to get organized to keep things at bliss. I am so, so thrilled because today I am finally releasing my free homeschooling planner for all the homeschool parents and teachers out there to enjoy. I understand the stress that homeschooling can generate without a clear organizing system. You can start organizing your homeschool life with the freebies that I am about to share! What are the homeschooling organizational printables included? Now you can plan your weekly activities and schedule your exams in your home school easily. This planner has beautiful pages for you to do that! Homework planning? Tracking down monthly activities? 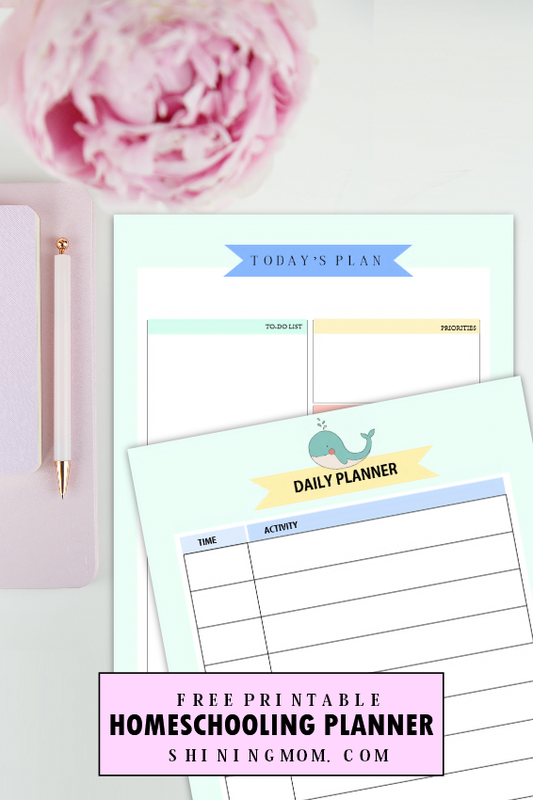 Everything is easier and streamlined with the planner. These tasks have been made so much organized and definitely easier for you! 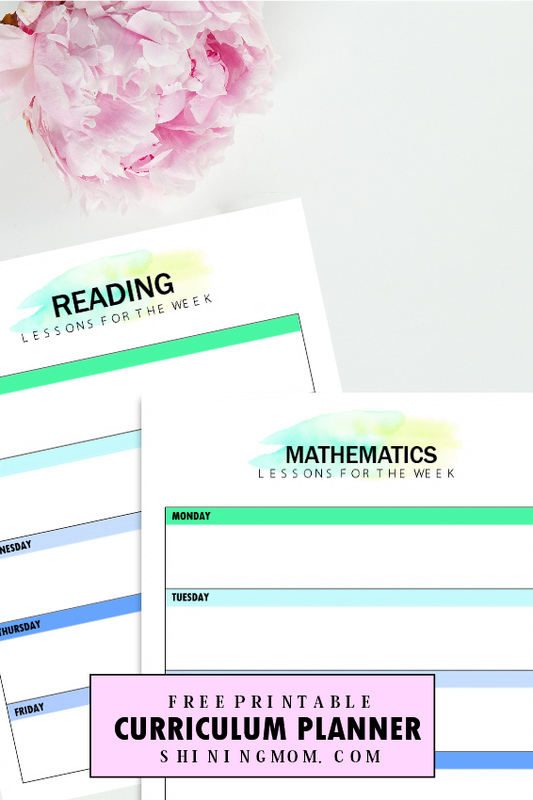 In addition to all of the organizers that I have included in your freebie, I’ve also weekly added lesson planning pages that you can use. This homeschool lesson planner covers the following subjects: Reading, Language, Writing, Science, Mathematics and more! There is also a blank page for you to write the particular subjects you teach. Here’s a sample page of your printable homeschool curriculum planner. These are just some of the pages included in this free homeschool planner. As I have said, you’ll get to enjoy a whopping 30 homeschooling organizational pages! And oh! Please know that your freebie also comes with four beautiful pages for you to choose from! Print the planner cover that you like best! Get the free Homeschooling Planner! Convinced that this homeschool planner is for you? As I have said, it’s for FREE! Simply sign up for the Shining Mom mailing list to receive your copy. Enjoy the free homeschool planner, friends! May it help you run your homeschooling blissfully! Are there any printable organizers that you wish I included here? Feel free to tell me at the Comments and I’ll try to include them in my future posts. 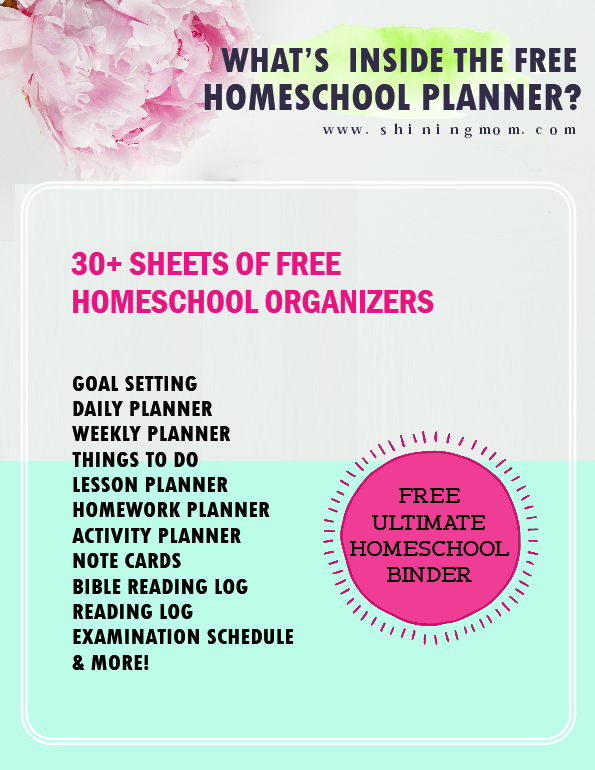 And oh, sign up for Shining Mom mailing list to receive your free homeschool planner! No time to print the free homeschool planner yet? Save this post for later by pinning it now on Pineterst! Have a great day, friends! Enjoy your stay at Shining Mom! « 15 FREE Trip Planner Printables for Your Next Vacation! I really love your homeschool planner, it is beautiful, nice and the best part is, IT IS FREE! thanks, sis. You’re most welcome! Enjoy the planner! i have seen a lot of free and paid homeschool printables but your struck me the most! its so simple to the eyes to see that it feels like i can utilise it really! 🙂 Thank you for making it free for us! You’re a blessing! Absolutely loved it. Looks beautiful. I was looking for homeschool planner.Thanks for sharing. Thanks, too! Enjoy the planner! I LOVE this!!! I it is exactly what I’ve been looking for, and the best part is…it’s free! Thank you so much! I am a missionary teaching Bible College classes in Papua New Guinea for Pastors and Pastors-to-be, most of whom do not even have smart phones, as they come from small villages in the mountains. They have no money to buy expensive paper goods, and there are no stores nearby who sell them. They have never been taught productivity so I have been printing your materials (I have used your free AND have paid for some) for the students. It has changed their lives! They are so happy and grateful to have things that help them get and stay organized. Thank you for your beautiful materials. You are a blessing, and so I bless you! Thank you very much. I am feeling the warmth of you blessings across the miles. I am truly delighted you are able to use my printables. May God bless you.